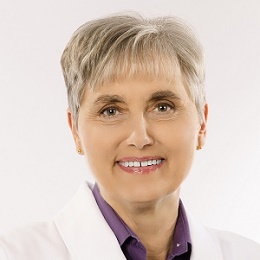 Terry Wahls, MD, is a clinical professor of medicine at the University of Iowa, where she teaches internal medicine residents, sees patients in a therapeutic lifestyle clinic, and conducts clinical trials. Dr. Wahls is also the director for the Extended Care and Rehabilitation Service Line at the Iowa City Veterans Affairs Health Care System. Dr. Wahls is a patient with secondary progressive multiple sclerosis, which confined her to a tilt-recline wheelchair for four years. She restored her health using a diet and lifestyle program she designed specifically for her brain and now pedals her bike to work each day. She is the author of The Wahls Protocol: How I Beat Progressive MS Using Paleo Principles and Functional Medicine and the paperback, The Wahls Protocol: A Radical New Way to Treat All Chronic Autoimmune Conditions Using Paleo Principles. Dr. Wahls teaches the public and medical community about the healing power of intensive nutrition. You can learn more about her work from her website: terrywahls.com.